If my neighbours are reading this, my apologies for shouting at the television screen during England�s 3-1 victory over a mediocre, so-slow Slovenian team that would struggle to beat one of our mid-table Championship sides. My expletives reached their peak when Wayne Rooney tucked away his penalty for his 44th goal in his 100th international match. This, commentator Clive Tyldesley informed us, equalled the Jimmy Greaves haul of goals and lifted Rooney to joint third place in the all-time England goal-scoring list. Clive is one of the better commentators and usually supports his observations with a spray of statistics. But in my view he did not make nearly enough of the fact that Spurs legend Greavsie collected his 44 goals in just 57 games. And not one them �on the cheap� from the penalty spot. Let me take nothing away from Rooney, who is one of the finest footballers of his generation. But as a goalscorer, he cannot be mentioned in the same breath as Greavsie. For the record, this was Rooney�s fourth successful spot-kick for England. Gary Lineker, second in the all-time list with 48 goals, netted four penalties, and leading marksman Bobby Charlton scored three of his 49 goals from the spot. Frank Lampard, with nine penalties, is England�s leading penalty specialist, followed by Alan Shearer and Ron Flowers with six each. Jimmy went off the idea of taking international penalties when he missed one as a teenager in an Under-23 match. From then on, he left the spot kick duty to the likes of Ron Flowers and Bobby Charlton. For those who were not around to glory in the genius of Greavsie, let me tell you that he was a sublimely skilled finisher who could thread the ball through the eye of a needle in a crowded penalty area. Okay, I admit to bias whenever I write about Old King Goal. Jimmy and I have collaborated on 20 books, and have known each other since we were both seventeen and on the first rungs of our careers, Jimmy making the headlines and me doing the much easier job of writing them. We are both approaching our 75th birthdays, and Jimmy will celebrate his next February 20th with one of his hilarious stand-up comedy-and-chat performances at Stevenage. Full details here at www.jimmygreaves.net. Let the facts speak for themselves about Our Jim: On top of those 44 goals for England, he scored another 13 in 12 England Under-23 matches � a record 357 �old� First Division goals � 495 goals in total, including 268 for Tottenham, a club record 220 of them in the League � a then Chelsea best 132 goals � the First Division�s top scorer for six seasons � a record six hat-tricks for England �. and a record six First Division hat-tricks in Tottenham�s Double season of 1960-61, but for Chelsea! Jimmy conjured many of his goals out of nothing, creating the openings himself with sudden changes of pace, clever dribbling and unerring accuracy with shots into the net that were more like passes. He never tried to break the net, just the hearts of goalkeepers. He played very much in the style of the modern master Lionel Messi, with the same deceptive, cunning running, a similar low centre of gravity, two footed but favouring the left foot, and with an eye for a chance that only natural goal scorers can spot ahead of the pack. But could Messi have done it on the mud-heap pitches of the 50s, 60s and 70s and with the likes of �Bites Yer Legs� Hunter and Chopper Harris trying to kick him up in the air at every turn? I wonder how many goals Greavsie would have scored for England if he had played 100 times? The mind boggles. There has been a lot of nonsense written and gossiped about Greavsie lately because he put his long-awaited 1966 World Cup medal up for auction, fetching a reasonable �44,000. Jimmy�s view has always been that he would rather have money in the bank for his family than medals collecting dust in safes. When you have a tribe of 13 grandchildren and great grandchildren medals won�t help pay the bills. Greavsie does not need medals or trophies to show what he achieved. It is written there for all time in the record books. The records state clearly: Jimmy Greaves was here. And weren�t those of us who saw him the lucky ones! CAN you imagine how Michael Dawson, Tom Huddlestone and Jake Livermore are licking their lips in anticipation of shaky Spurs coming to Hull on Sunday? They will be doing their best to make it hell in Hull for the Tottenham club that decided they were not good enough to wear the Lilywhite shirt. There will be crushing pressure on Mauricio Pochettino and his beleaguered players to produce a winning performance after the stinker against Stoke. And Emmanuel Adebayor can expect a less than warm welcome from the travelling Spurs fans if he gets on to the pitch at the KC Stadium. The enigmatic, egocentric Adebayor opened his mouth wider than he has opened his legs this season when he blamed the Tottenham supporters for the team�s unacceptable home performances. Let�s see Adebayor and his hugely rewarded team-mates start to put action where their mouths are. A defeat at Hull could have serious repercussions for Pochettino in particular and the team in general, with a mass clear-out likely in the January transfer window. It will be like watching I�m A Footballer Get Me Out of Here if Hull push Spurs into the relegation rat race. Each week here in my Spurs Odyssey home I test your knowledge of Tottenham. Last week I asked: Who once scored all four goals against Manchester United in a 4-1 First Division victory at Old Trafford? I apologise for having wrong-footed those who read an early version of my blog, in which I transferred the match to White Hart Lane. A senior moment. Martin Peters was the four-goal hero, and his fantastic feat included a first-half hat-trick, and it hurried the departure of Man United manager Frank O�Farrell and ushered in the era of Tommy Docherty. The first name chosen at random from the correct entries: Aubrey Jones, of Cardiff, who wins the autographed copy of Lane of Dreams. 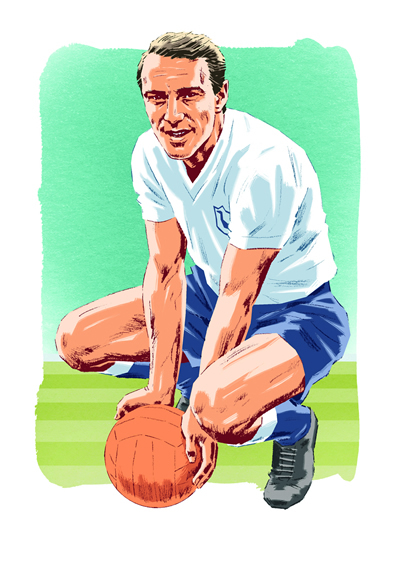 This week�s teaser features another goal-scoring Lane legend: Who has scored 21 more goals at international level than Jimmy Greaves and netted 93 League goals in two spells with Spurs? Thanks for your company. Hope it�s not hell in Hull on Sunday. COYS! P.S:- Note that Norman's piece was written and submitted before England beat Scotland 3-1 at Celtic Park last night (Tuesday 18th November). Publication has been delayed due to unavoidable technical difficulties.